If you’re in South-East Queensland, then Noosa should be on the top of your list of places to visit. Apart from being some of the more expensive real estate in Australia per square meter, it also has stunning natural features to view, friendly locals, delicious food and plenty of outdoor activities. We stayed the week in Little Cove and spent most of our days lazing at the beach, sunning ourselves by the pool, doing fasted cardio each morning, picking up iced lattes from the nearest coffee shop and finding delicious places to eat on Hastings Street. Lets start with the most important food – gelato! We recommend two places – Massimo’s Gelato on Hastings Street (try the coconut, passionfruit, tiramasu flavours) and Amo Gelato at Noosaville (try the salted caramel & peanut brittle!). Next, the best cocktails we found were at a place called The Boardwalk Bistro – we only had drinks there so we can’t comment on the food. If you do go, we highly highly recommend the ginger mojito and the lychee lemonade. The ginger mojito is now my all time favourite cocktail! One of our favourite places for lunch was Mooshka (we found it by accident as we were trying to go to Sum Yung Guys which is actually located above them!). It has a funky, eclectic mix of retro and vintage furniture, a delicious drink/food menu & a relaxed and welcoming atmosphere. We choose to stay even after they informaed us we were in the wrong place haha. I had a super tasty and fresh grilled squid salad with flash fried salt & pepper squid, salad, chilli lime dressing + a glass of sav! David had the smoked salmon poke bowl with calrose rice, avo, cucumber, carrot, pickled ginger, soy dressing + a pale ale. Afterwards, we recommend a nice walk or swim at Sunshine Beach or a drive around the suburb to check out all the beautiful holiday homes. We were walking to lunch at Bistro C and stumbled across Laguna Jacks Steak House – we were walking down the street and heard music and laughing so we looked up to see people having a drink on the balcony. The atmosphere looked so good we wanted to get in on it as well. It was a good choice as the food was reasonably priced, delicious and the drinks were iced cold (important for a mid 30 degree day). We choose specials from the lunch list – I had a grilled salmon and asian noodle salad and David had a steak burger with fries (however I stole most of the fries haha). We had two low carb ciders and two glasses of sav (no we’re not alcoholics – we just enjoy a drink or two with lunch while we’re on holidays :). Another lunch place we happened to find while walking down to the shops one day was called Canteen. It was a cosy and friendly place where we had a light lunch. It wouldn’t be our top pick in Noosa but it was open on a public holiday and we can’t argue with that. We shared a calamari salad, nachos and two iced lattes – the food was good but nothing to rave about. Other places we recommend are: Bistro C (make sure you book ahead! ), Betty’s Burgers (we rate the mushroom burger) and Locale (for local, seasonal produce and seafood). 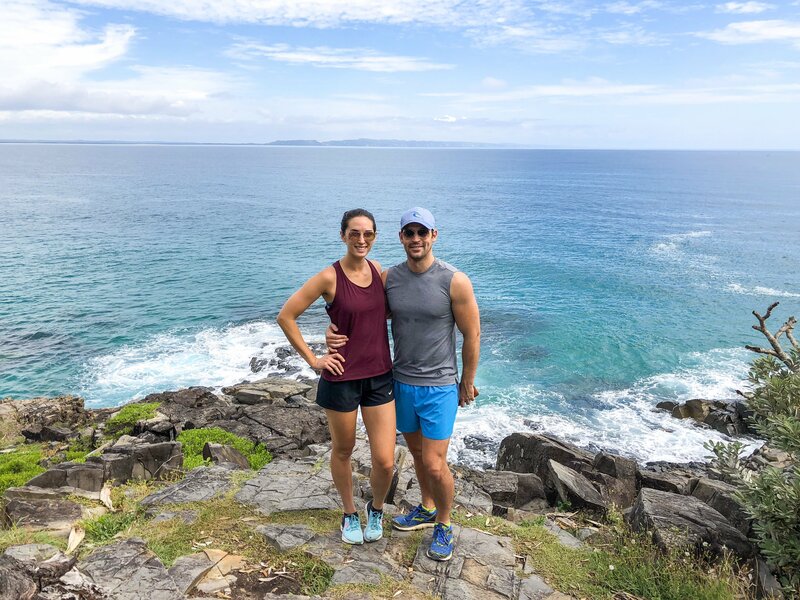 Each morning we woke up and did some slow steady state fasted cardio in Noosa National Park. The boardwalk was right outside our apartment so we joined (what seemed like hundreds of others) for some brisk morning cardio. In the past year, the park has had some work done to it to make it much more accessible for prams and walkers. The previously sand track has been replaced with concrete and hard gravel tracks making the ocean walk much more pleasant. There’s also lots of new places to sit and rest or take in the spectacular views. The beautiful view from Dolphins Point was one of our favourites. Hire a paddle board and go stand-up paddling (SUP) – hot tip: Little Cove is nice and protected from the wind so is the perfect place for beginners. Fly a kite at Sunshine Beach. Visit the lookout behind Little Cove – Laguna Lookout (you can walk or drive up). Wander down Hastings Street and window shop (or take your wallet with you and stock up in the little boutiques). Take a picnic with you to Main Beach and watch the waves roll in and the sun set. Visit Eumundi Markets on a Wednesday or a Saturday or the Noosa Farmers’ Markets on a Sunday. If you have a car, take a day trip to Kondalilla National Park (they have a stunning waterfall and rock pools too). To read more, see my blog on the park here.